Advantage PS Series Small Pump Tank / Heat Exchanger systems are used in many industrial applications, including isolating cooling water from process water, and collecting and cooling gravity return water from open bath extrusion applications. 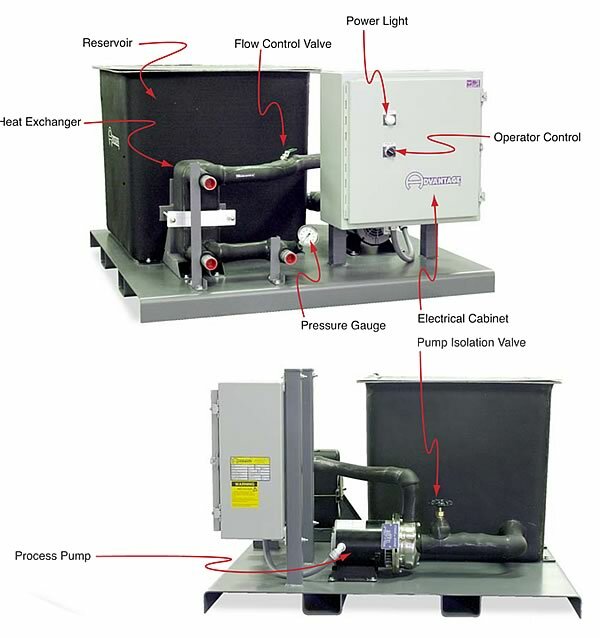 PSE Series systems are available with polyethylene, epoxy coated, or stainless steel reservoirs from 65 to 200 gallons. Pumps from 1/2 hp to 5 hp are available. ob specific brazed plate or shell and tube heat exchangers are an integral part of the PSE system. PSE Systems can be customized to meet unique customer requirements. For more information about PSE small pump tank / heat exchanger systems call the Advantage Sales Department at 317-887-0729. Would you like to Download FYI #244 to your browser?